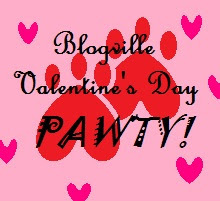 Jess and Glacier’s Blogville Pawty began over a week ago. As mentioned here, they are helping to raise funds for a woman who fosters dogs to put up a new privacy fence. Canyon and Rogue have been entered into the kissing booth, so please give them a KISS! Canyon and Cessna have been entered into the contest for Valentine’s Day king and queen, so please click and VOTE! In addition to these two events, they have also set up an online raffle and a chance to buy some tasty treats for your sweetheart, so check them out as well. On another note, Mango Minster 2012 begins on the 12th. And Ushi is entered into the Bad Sport category. Please take a look when you get a chance. I’ll let everyone know when the voting begins. I think that’s all the updates for now. If I’ve missed anyone’s event or you’d like me to announce something, please leave a comment. I, Woagie, would wike to wake a mowent, to wake a wittle announcement! Ow fwends, Jess and Gwaser, are hoassing a Pawy to help waise money foe a wady who fosters wescue dogs. I don’t understand why Mommy let that pesky brat write this for her….obviously, I’m much smarter! So…what the brat was trying to say, was, that our Auntie Jess and my buddy Jetta’s successor, Glacier, are hosting a Pawty over at At a Glacial Pace, and would appreciate your support in any way. Orr Join and vote for me and the stud (I sure wish he’d go away, so I can stop pretending) in the contest for Prom Queen and King. If you can’t participate, but would still like to help out, please help me spread the word about this wonderful fundraising event! It’s Cessna and Phoenix here. Mom is a little busy so, we offered to take over and let you all know about a fundraising project our friends over at Dog’s Eye view are undertaking. Jack is from Guide Dogs of America, so L^2 has decided to begin their fundraising project for their upcoming 6 month anniversary. If you’d like some more information about the project you can also visit this post. Both Phoenix and I are not from Guide Dogs of America, but think it is important to help out friends when possible. If you’d like to help L^2 and Jack with their project, please visit the links we’ve provided for instructions on how to donate. Now that we’ve gotten that out of the way, Phoenix thinks we should tell you all about the wonderful toys Mommy and Daddy bought us and all about the treats they made. On Tuesday Daddy came home from work with a big box – I don’t remember there being toys at his work…guess they were hiding them on me! When Mommy opened the box, there were some really fun things: a Galileo Bone, a Nylabone Double Action Revolving Chew, a liver flavor Nylabone, a lime green Tough By Nature Good Cuz, a lot of squeaky Air Kong Tennis Balls,a yellow stuffed duck and white stuffed lamb that honk, an orange and black JW Arachnoid Ball and two new Kong Wobblers that Mommy says is for Aiden and Reece. Canyon really likes the JW Arachnoid Ball and Air Kong Tennis Balls, Aspen likes the yellow duck and Phoenix says he is a little too old to be playing with all that, but finds it fun to grab one and tease canyon – I actually like doing the same thing!! Then this weekend we got even more surprises! Mommy and Daddy made us new cookies to share. They made some shrimp ones for me by grinding the leftover tails and shells into a paste to mix with some spelt flour and then made some banana/cinnamon ones for the goldens . Then for Phoenix, Daddy made some more dehydrated veggies – turnip, sweet potato and a really weird purple one. Well that’s all for now, but Phoenix and I hope you had a wonderful weekend and that you will try and help our friends sponsor a puppy.